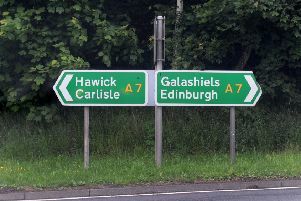 Almost 20 pothole-riddled urban roads are now in line to be resurfaced after Scottish Borders Council agreed last Thursday to divert an extra £1.98m of capital funding to repairs. The resurfacing of 19 roads agreed will take place this financial year at a cost of £1.33m, with the balance going on short-term overlays, drainage and the patching of roads in villages and rural areas. Once another £422,000 is to fix flood-damaged bridges at Bowanhill, Selkirk and at Newmill, near Jedburgh, is taken into account, the repairs approved add up to a £2.4m package. While welcoming the windfall from other capital projects that have underspent or been abandoned or delayed, Selkirkshire councillor Gordon Edgar, the authority’s executive member for roads and infrastructure, warns that more money is required to bring the region’s road network up to scratch. “I cannot overstate the importance of having safe and well-maintained roads,” said Mr Edgar. “Our businesses, schools and social work services all depend on them, and I’m afraid that roads have been the poor relation when it comes to this council’s other spending priorities in these challenging financial times. “Even with this extra boost, which I have fought hard for, I reckon we need to be spending £12m every year for the next five years to make a real difference to our 3,000km of roads and countless bridges. More than half the £2.4m roads spending boost, unanimously endorsed by councillors last week, is down to the freeing-up of £1.28m the council had set aside in its capital programme to provide a 3G synthetic sports pitch in Peebles but now going spare. With the failure of that community to reach a consensus on a suitable location, the project has been shelved indefinitely, much to the annoyance of Tweeddale West councillor Catriona Bhatia. “To say I’m angry at this turn of events is putting it mildly,” Mrs Bhatia told the full council meeting. “We will now have three 3-G pitches – in Hawick, Selkirk and Galashiels – but none at all in Peeblesshire or Berwickshire, which means the provision is neither fair nor inclusive. Mrs Bhatia’s call for council officers to liaise with the two football clubs in Peebles and investigate the potential for improvements to the grass pitches at the town’s Violet Bank was unanimously endorsed.